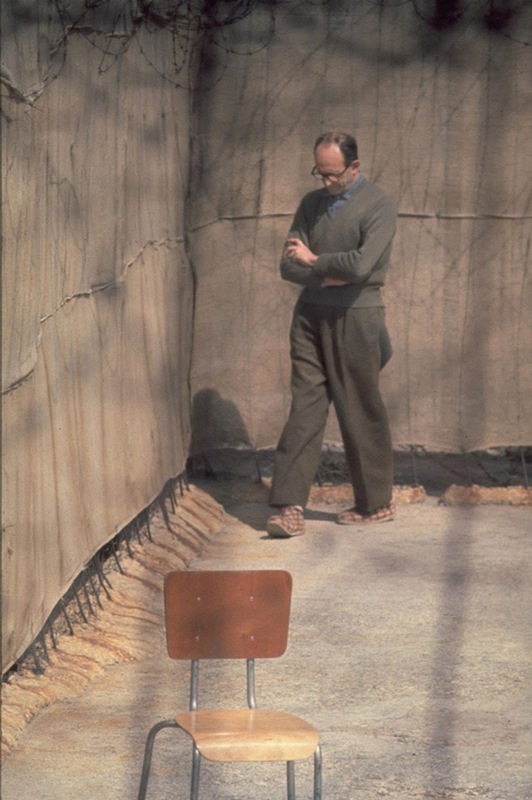 Adolf Eichmann walks around the yard of his cell, Ramla Prison, Israel, 1961. Adolf Eichmann was a German Nazi SS-Obersturmbannführer (lieutenant colonel) and one of the major organizers of the Holocaust. Because of his organizational talents and ideological reliability, Eichmann was charged by SS-Obergruppenführer Reinhard Heydrich with the task of facilitating and managing the logistics of mass deportation of Jews to ghettos and extermination camps in German-occupied Eastern Europe. After World War II, he fled to Argentina using a fraudulently obtained laissez-passer issued by the International Red Cross. He lived in Argentina under a false identity, working a succession of different jobs until 1960. He was captured by Mossad operatives in Argentina and taken to Israel to face trial in an Israeli court on 15 criminal charges, including crimes against humanity and war crimes. The Mossad was able to get an EL-AL to Buenos Aires to extricate Eichmann from Argentina. When the Argentinians discovered the real reason for the jet being in Argentina, they tried to stop it from flying back to Israel. The Mossad was only able to escape because they flew directly to Africa to refuel instead of remaining in the Western Hemisphere like they reported they would in their itinerary. He was found guilty and executed by hanging in 1962. He is the only person to have been executed in Israel on conviction by a civilian court. Eichmann was hanged shortly before midnight on May 31, 1962, at a prison in Ramla, Israel. His executioner was Shalom Nagar. Eichmann allegedly refused a last meal, preferring instead a bottle of dry red Israeli wine produced by Carmel Winery, consuming about half the bottle. He also refused to do the traditional black hood for his execution. Long live Germany. Long live Austria. Long live Argentina. These are the countries with which I have been most closely associated and I shall not forget them. I had to obey the rules of war and my flag. I am ready. Shortly after the execution, Eichmann’s body was cremated in a specially designed furnace, and a stretcher on tracks was used to place the body into it. The next morning, June 1, his ashes were scattered at sea over the Mediterranean, beyond the territorial waters of Israel by an Israeli Navy patrol boat. This was to ensure that there could be no future memorial and that no country would serve as his final resting place. And you think you are better than this one.